David Autor has a new paper that he presented at the Federal Reserve conference in Jackson Hole, Wyoming last week where he argues that labor-saving robots (and other new technologies) won’t raise unemployment. This has been a worry at least since the Luddites fought against new industrial-age technologies two centuries ago. Mass unemployment is a cyclical thing that can be eliminated through effective monetary & fiscal policies like Willem Buiter explains in his new paper about helicopter money. Autor’s paper shows that technological change helps explain why inequality has risen (and median income growth stagnated) in the past few decades. This is not likely to change unless governments change policies in ways like Matt Yglesias suggested in an article about technology and inequality last spring. 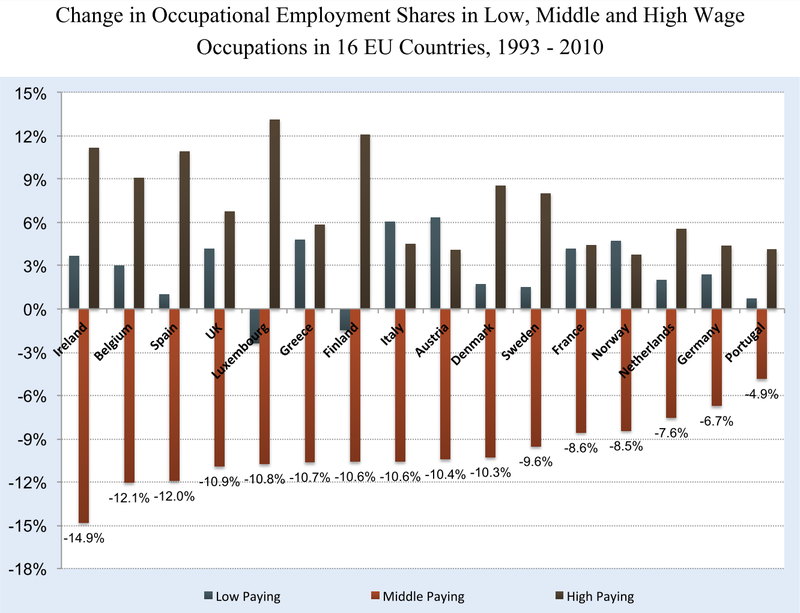 For example, Autor’s paper shows that low-wage jobs like fast food work has been growing rapidly all across the industrialized world and high-wage jobs like investment banking has also been growing. But middle-income jobs have been shrinking. This is useful for two reasons. First, it is yet another set of data that reinforce the fact that inequality is rising. There are still some professional inequality denialists out there and they have been winning the popular sentiment in America. The median American thinks that America is far more equal that it really is. Secondly, a lot of people have always feared that productivity-increasing technology will cause mass unemployment. For example, a lot of bright people in Silicon Valley were talking about it last week. Autor’s paper reinforces the fact that new technologies have often changed the distribution of income, but they have never caused mass unemployment. Right now we have an unemployment problem that could be fixed with better monetary policy and an inequality problem that will just keep getting worse if Thomas Piketty’s new book is correct. These challenges will probably only keep growing due to the technological and demographic forces behind secular stagnation and rising inequality.